PM Studios and acttil today officially announced the physical versions of OPUS Collection, WILL: A Wonderful World. We’ve actually known about both for quite some time due to leaks from the ESRB and retailer listings. We don’t have a specific date just yet, OPUS Collection is planned for April (with a voucher code for a downloadable bonus soundtrack included). WILL: A Wonderful World will follow sometime in May. Pricing is set at $39.99 each. WILL: A Wonderful World was given a new rating by the ESRB last month. It was a sign that PM Studios will be bringing the game to retail, though we didn’t have an official announcement. Although that’s still the case, we essentially have confirmation at this point. 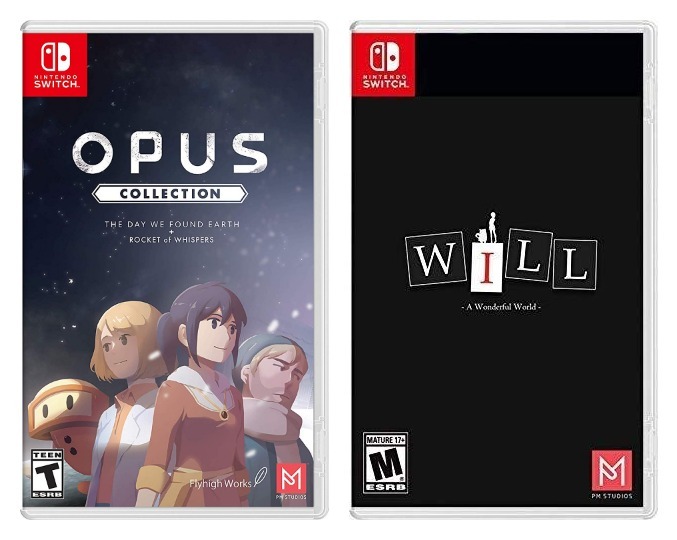 Amazon and GameStop have both put up listings for a physical version of WILL: A Wonderful World. Given their track records, it’s safe to say that it’s happening. We just need the news from PM Studios officially – which shouldn’t be too far away. If Amazon and GameStop are to be believed, we’ll be seeing WILL: A Wonderful World on store shelves in Q1 2019. Both list a tentative March 26 release date. WILL: A Wonderful World made it to Switch last month. As of now, it can only be found on the eShop. But could we be seeing a physical version as well? This week, WILL: A Wonderful World received a new rating from the ESRB. It’s noteworthy due to the publisher listed: PM Studios. PM Studios has worked with Circle Entertainment and Flyhigh Works to bring a number of Switch games to retail, including Voez, Deemo, Mercenaries Saga Chronicles, and the recently-announced Opus Collection. WILL: A Wonderful World could be next. It’s worth noting that news about Opus Collection’s physical version originally leaked from the ESRB as well. We could be seeing a similar situation here with WILL: A Wonderful World. Circle Entertainment has issued a launch trailer for WILL: A Wonderful World, which is out now on the Switch eShop. Watch it below. WILL: A Wonderful World will soon be appearing on Switch as a digital download. Check out 18 minutes of footage below. Circle Entertainment and WMY Studio have set a release date for WILL: A Wonderful World. The story-driven puzzle game launches October 18 via the eShop. WILL: A Wonderful World will normally be priced at $14.99 / €14.99. However, a one week launch discount price of $11.99 / €11.99 is planned. Circle Entertainment has announced a partnership with 4D Door Games to bring WILL: A Wonderful World to Switch. We’ll be seeing it on the eShop later this year. WILL: A Wonderful World is a story-driven puzzle game. By viewing and altering letters, you can impact the tale and influence characters as a “god”.